How To Get Rid Of Kitchen Grease + One Year Supply Giveaway! No more wondering if you should throw your kitchen grease down the sink, in an old can, or straight into the trash. 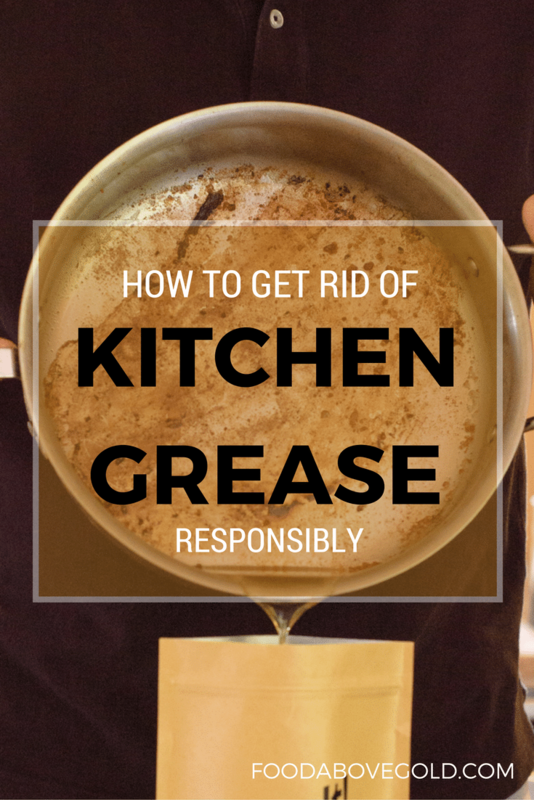 Find out the best way to get rid of kitchen grease and how it will save you money! This post is sponsored by Toss-It Brand and helps keep Food Above Gold ad free for your enjoyment! As always, all opinions are my own. I saw something on Pinterest once about how you could put cooking grease down the drain if you run hot water behind it. As we all know, pinterest is a very reliable source ( 😉 ), so for many years I accepted that it was a legitimate way to get rid of kitchen grease. I’m here to tell you friends that THIS IS NOT TRUE! Just ask my Mom! As a result of years of putting her bacon grease, chicken fat, and numerous other things down her sink, she had to cut open the pipes under her house to remove a nugget of fat more than a foot long! As said in the voice of Sara with no h . . .
What Kind Of Grease Should I Dispose Of? …meat fats, dairy products, food scraps, cooking oils, baked goods, sauces, dressings, sandwich spreads, gravies, marinades, dairy products, shortening, lard, butter and margarine. FOG is produced by restaurants, cafeterias, delis, bakeries, residential homeowners, daycares, assisted living, social halls….. basically anyone who deals with food, especially while cooking. I don’t know about you, but when I read that I thought to myself – “Oh shoot! How many times have I put mayonnaise, marinades or vinaigrettes down the garbage disposal without even thinking about it!?!?”. I had never considered that these already liquid substances wouldn’t be safe to dispose of in this way. Most of the time, the FOG that we think of are bacon fats. However, there are many other meat fats that we deal with weekly that need proper disposal. Like the fat from ground beef when making tacos or lasagna, or the juices left behind after you roast a chicken. Additionally, with more seasonal relevance, the fat you don’t use for gravy after making your Thanksgiving turkey. Zippered Closure. This makes sure the fat, whether bacon grease that gets solid, or turkey fat which remains liquid, stays inside of the bag. Expandable Bottom. This helps the bag stand upright while you are pouring in the fat. Leak-Proof Edges. Not only will the grease not come out of the zippered top, but the sides have also been designed to not leak, also. Heat-Proof Lining. I want to be clear when I say this – DON’T use this as an excuse to pour fresh-from-the-oven grease into the bag. You run the risk of burning yourself when you do this. But once, the grease has come down to a safe temperature (think, water won’t sizzle if it touches the grease) then you can move it to the bag and the bag won’t melt! I definitely ran a few of my own tests on this product. I tried leaving it full on the counter for a few days to see if it got soggy and leaked. (It didn’t.) I also left it turned over inside of a bowl to see if it would leak (It didn’t.). The only thing I found to be lacking was a maximum fill line. That discovery came only after I had cooked 3 pounds of bacon in one day (is that too much?). 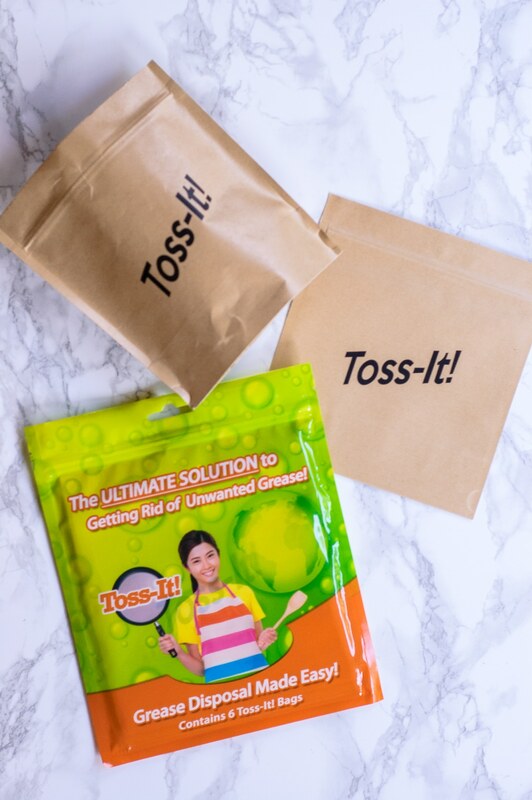 My favorite reason to use these Toss-It bags, is the time and money saving benefits! By using a proper disposal receptacle you don’t find yourself losing time when you have to clean up a spill after the fat leaks out of your garbage bag. I don’t know about you, but I much prefer having a sealed container to get rid of kitchen grease rather than an open tin can. And, as a result, you don’t run the risk of massive damage to your pipes like my Mom. Because significant amounts of FOG ares discharged in wastewater from restaurants, multifamily and single family homes, the propensity to cause blockages in sewer lines are significant. Of the tens of thousands of sanitary sewer overflows that occur each year in the U.S., approximately 48% are due to line blockages, of which 47% are related to FOG deposits that constrict the access of pipe. Waste water treatment plants struggle to keep their systems grease free, and encourage people to dispose of unwanted grease in the trash. The Toss-It bag was created to solve these environmentally damaging issues. So, by using this product, you can prevent draining issues and dispose of grease in a responsible way. Go HERE to buy Toss-It Bags for Yourself! 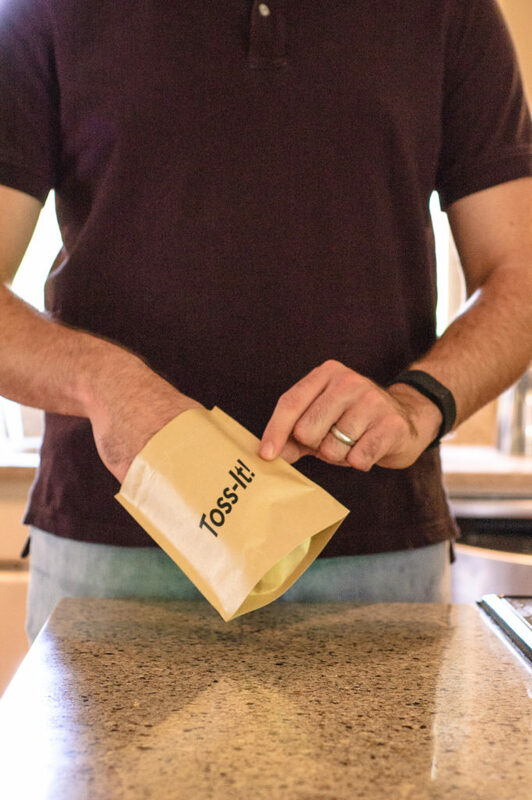 Toss-It bags come in packages of 6, are easy to store, and even easier to use! You know these are going to be your new best friend! I’m even going to admit a secret about how I use these to get rid of kitchen grease. I keep a Toss-It bag under my sink and use it for the accumulation of little things like sauces and marinades throughout the week. Win A Year’s Supply Of Toss-It Bags! To help you get on the right foot with responsible grease disposal, we’re giving away a YEAR’S SUPPLY of Toss-It bags! Each of the ways to enter below is worth a different amount of entries, and you can get 5 bonus entries for doing them all! 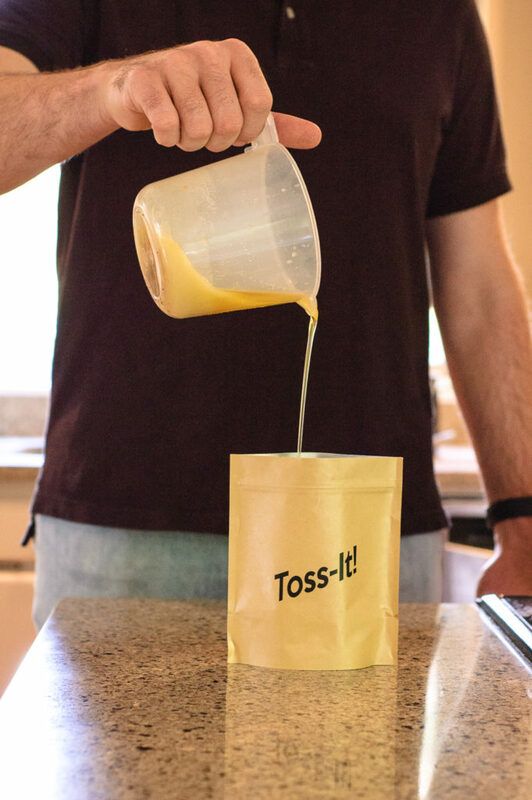 Want to make sure you get stocked up on Toss-It bags whether you win or not? Go HERE to order some for yourself – it’s less than $5 a package! How do you usually get rid of kitchen grease? How excited are you for a product to help with this issue? Tell me about it in the comments or show me on social media – @foodabovegold. Show me how you’ve put your Toss-It bags to use, and tag it #CallMeMichelin. Don’t forget to give Toss-It some love on social media and tell them how excited you are about their bags! You can find them on Twitter and Facebook. Unfortunately, I usually just rinse it down the drain, unless it is a large amount, in which case I let it harden and then “toss it” in the trash. This is BRILLIANT! I like that you don’t have to wait until the grease cools completely before dealing with it. this is awesome! I usually save it in a cup, until it solidifies, then toss it in the trash. It’s a pain! MacKenzie, this is a lightbulb moment for me! I’ve always put my leftover bacon grease and other fatty lards in an empty tin can and stuck in the fridge or freezer to set up before tossing it — but these little bags would be so convenient. And no — 3 pounds of bacon at once isn’t a problem! LOL! I thought of this when I saw your homemade bacon post! 🙂 I love these bags because they’re extra useful for those things can’t set up, like vinaigrettes or chicken fat. They’re so helpful! Wow! This is such a great idea!! I had been using kitchen towels or old plastic bottles. This is just brilliant! Thanks so much for sharing! Love this! It would be great to win, but those bags would be awesome to have! I love how affordable they are! It makes it simple and affordable to be responsible! How to best throw out grease and oil has been a quandary for me for years. These are a great solution! I didn’t grow up cooking, so when I moved out on my own I just assumed “it’s liquid, right?!?!”. I was amazed when I learned things like dairy shouldn’t go down the sink. Woah! So this was an eye opener! I had no idea and yes I’m guilty as charge with the hot water myth! Thanks for opening my eyes. I always knew there had to be a better way. Super idea, normally down the sink very naughty!! I usually pour it into an empty coffee can, but when I don’t have one available I’ll pour it into a storage bag or plastic container. These are a great idea!